I hope I haven't thrown off the universe by putting my lookbook post on a Wednesday. ;) Things got switched around on the blog, but all's good because we have a new outfit post and it features polka dots and outfit remixing. This came about because I wanted to wear more printed shorts, but then realized that I didn't have any other printed shorts to wear. Until I remembered this pink patterned romper and had the idea to jazz it up with a nice top. | Modcloth Through the Wire headband (similar) | Nastygal hit the spot blouse | Ross patterned romper | Forever 21 belt | Zara high heel sandal (similar) | Classic Winchester lady watch c/o Daniel Wellington | I think this is my first time outfit remixing on the blog...like, legit remixing. 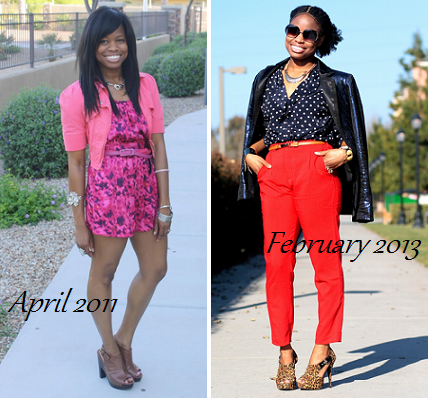 The romper was last seen in my Pretty in Pink post from April 2011, and the top is from my Layered Muse post from three months ago. Wore this for a nice little weekend lunch and ice cream. I ate horchata ice cream and it was quite delicious. You must try it if you're a fan of the drink. What do you think of this look? Have you ever remixed a romper before? pink AND polka dots? LOVE IT!!! Love how you styled your romper into shorts this time around! I hop you do other remixes, it's always great to see the versatility of outfits. I like the re-mix, Cheryl:) Polka dots do go with everything. This is such cute print mixing - and I just love that romper! I am loving this outfit remix!!! You have to do it more often!! You look adorable!! The romper provides this unique pop of color that I LOOOOOOVE. I enjoyed the post. Kinda makes me want to try remixing. Love your remix! What an original way to pair a romper! Love the pink belt too - kind of pulls everything together. Very cool this "mix & match" look!!!! I think the romper is very cute! I love this remix! The colors work perfectly together. I really love that romper. so cu-ute! love the bold pink and the dots. such a fun flirty spring look. Love your innovation in remixing these two pieces, they work together wonderfully. very cute!! and i like your shoes!! This is adorable on you Cheryl and I haven't ever remixed a romper but I always want to because they always seem to be on the short side. I love how you mixed the hot pink and polka dots, I also love your April 2011 look. The combo of prints and colors in this loom are stunning! That pink really pops next to the navy. Love your shoes too! I LOVE this look because you can see the pink romper peeking through the top and also the shorts but then it's like "hey i'm wearing a romper" because of the polka dot top. Super cute with the added pink belt. And LOVE the first photo. Crisp, great focus on you! Cute outfit Cheryl, love the pink belt especially! Cute look! Love the color combo and jewelry, especially! Great combination! I love the pink and dark blue together!